Democrat Pete Gallego is challenging U.S. Rep. Will Hurd for the sprawling CD-23 seat. Hurd won the swing seat from Gallego two years ago; no incumbent has won a second term in eight years. Official House. While neither Hillary Clinton nor Donald Trump have put much money so far into winning Texas, the state's only competitive U.S. House race is proving to be a cash cow for local television stations. By Election Day, national Democrats and Republicans are projected to spend over $12 million on television ads targeting the Texas 23rd Congressional District, which stretches from El Paso to San Antonio. 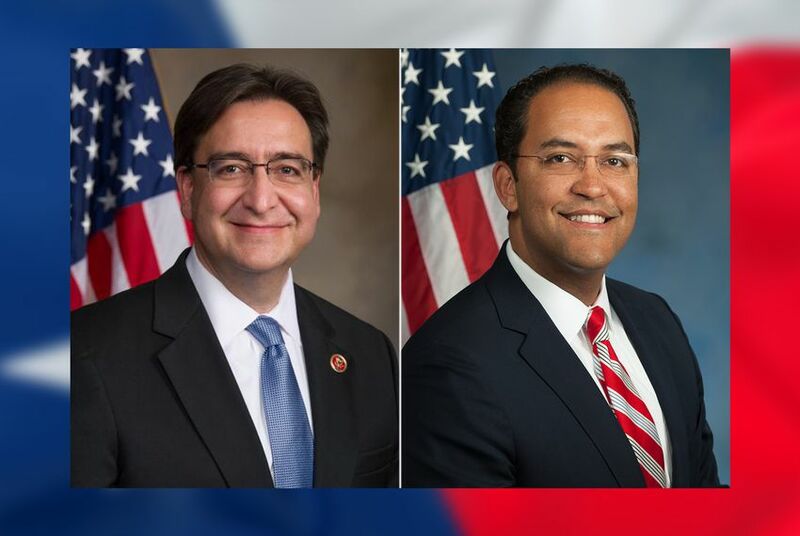 It’s a rematch between Republican U.S. Rep. Will Hurd and Democratic former U.S. Rep. Pete Gallego. Both men are popular among their fellow members of Congress, and there is surely sentimental interest from leaders of both parties in seeing their man return to the U.S. House next year. But also, as Donald Trump's campaign struggles among traditionally Republican voters, he increasingly puts GOP control of the House at risk. The Texas 23rd District is ground zero for that fight. The national party apparatuses are both spending millions to save — or retake — the seat. Each side has a trifecta of key spending sources: their candidate's campaign, their respective parties' House leadership campaign arm and a super PAC that is loosely aligned with party leaders. Gallego and his Democratic backers are projected to spend about $6.3 million, while Hurd and his Republican allies are on track to spend around $5.7 million, according to sources from both parties who track campaign television advertising. Of those sums, the candidates themselves have made substantial buys. Gallego's campaign bought an estimated $800,000 in ads on its own and joined with the House Democratic campaign arm on another $450,000 in ads, approximately. But Hurd — who dominated Gallego in fundraising throughout the cycle — has far outpaced his opponent in ad spending, plunking down about $1.95 million. That advantage packs a bigger punch for the Republican side because under federal law, candidates secure lower rates for their TV advertising than outside groups. At the same time, the Democratic Congressional Campaign Committee and House Majority PAC — a super PAC aligned with Democratic House leadership — picked up the slack for Gallego, surpassing the Republican side in total spending. Democratic outside groups are spending about $1.3 million more than the Republican organizations on the 23rd District - and it's money Democrats desperately need elsewhere in the country to take advantage of the turbulent environment Trump has created for downballot candidates. Trump’s campaign turmoil potentially puts more Republican House seats in play, creating pressure on those Democratic groups to launch ad wars for more Republican-leaning seats in places like California and New Jersey. Hurd for Congress: the biggest group giving to the incumbent was his colleagues in Congress. House Republicans gave Hurd $400,000 via their own campaigns and their leadership PACs. The National Republican Congressional Committee: The securities and investment industry was the largest donor to the the official House GOP campaign arm, with $13.1 million in donations. Congressional Leadership Fund (a Republican super PAC): Sheldon and Miriam Adelson, the Las Vegas-based billionaires, were the largest donors to CLF, giving the group $10 million apiece. Robert McNair, the owner of the Houston Texans, was also a big donor, giving $1 million to the group. Texans for Pete: The top sector donating to Gallego's campaign fund? Lawyers, who gave him $176,000. But like Hurd, Gallego's former congressional colleagues have rallied behind him, giving an aggregate $173,000 between member campaigns and leadership PACs. DCCC: Retirees made up the largest donor group to the official House Democratic campaign arm, sending $14.8 million to the committee. House Majority PAC (a Democratic super PAC): Fred Eychaner, a Chicago-based media executive from a company called Newsweb and Donald Sussman, a hedge fund manager at a firm called Paloma Partners, were the top two individual donors to HMP. Each gave at least $6 million to the super PAC. Unions constituted an additional $2.7 million of HMP money. Additionally, a group called Patriot Majority USA supports Gallego, but it is an organization that uses a non-profit structure to avoid disclosing donors in a timely manner. In the 2012 election cycle, labor was the predominant donor to the group. Some Texas counties saw as much as double the number of votes cast Monday than they did on the same day in 2012. The Castro brothers will campaign across Texas as polls show a much closer-than-usual presidential race here.